“Vase with Mermaids and Centaurs” (TIB title for Alberti’s engraving [TIB 34 (17).164 (110)]), plate 4 in the series of ten engravings, “Antique Vases”, c1600s–1720, published by Samuel Sympson (fl.1720s–1751) after engravings (in reverse) by Cherubino Alberti (1553–1615) executed in 1582 after Polidoro da Caravaggio’s (c1500–1536/7?) 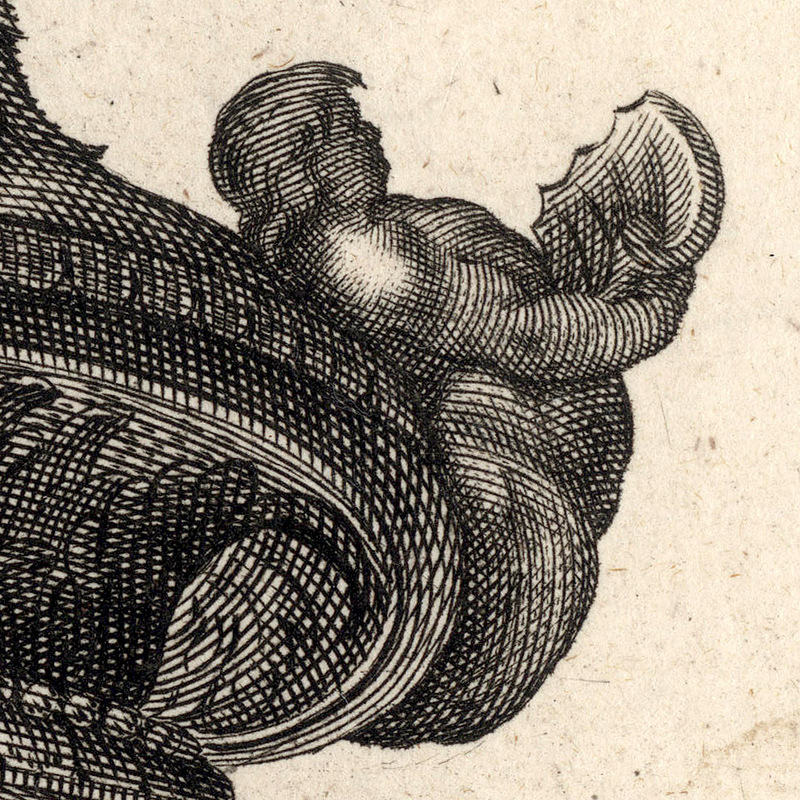 frescoes above the first floor windows of the Palazzo Milesi in the via della Maschera d'Oro in Rome (see Michael Bury 2001, “The Print in Italy 1550-1620”, British Museum Press, London, cat. 97). 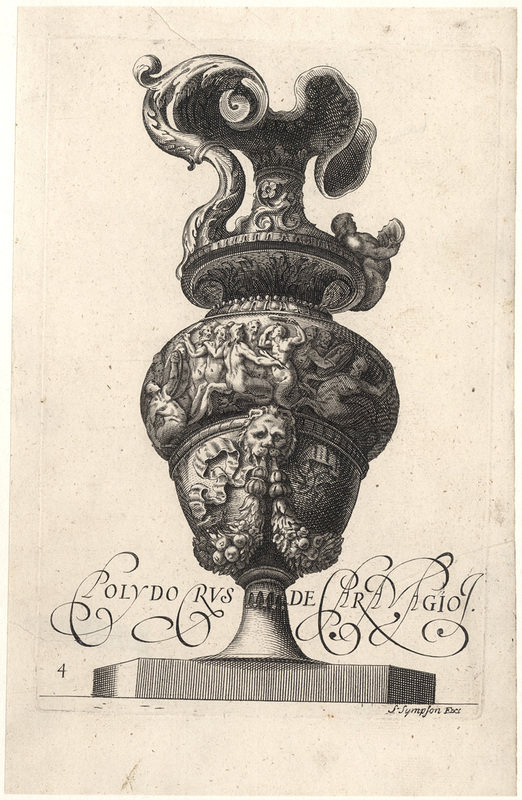 Etching and engraving on laid paper backed with a support sheet. Berlin 1939 1130 (copies) (P Jessen 1939, “Katalog der Ornamentstichsammlung der Staatlichen Kunstbibliothek Berlin”, Berlin); Guilmard 1880/1 294.47(1) (copies) (Désiré Guilmard 1801, “Les Maitres Ornemanistes: Écoles Française, Italienne, Allemande et des Pays-Bas (Flamande et Hollandaise)”, Paris, E Pron et Cie); Bartsch XVII.110.161-170 (copies) (Adam Bartsch 1803, “Le Peintre graveur”, 21 vols, Vienna). 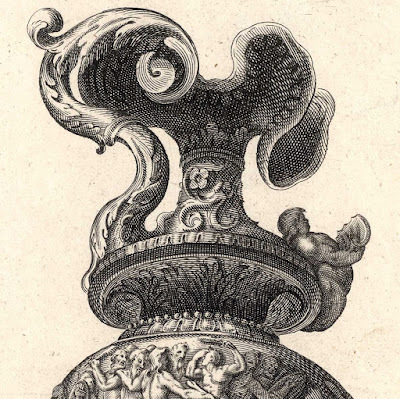 Note that Aegidius Sadeler II also made a set of engraved copies of Cherubino Alberti’s “Antique Vases” but the Sadeler’s prints do not have the borderline flanking the base of the vases and the base of the vases are inscribed, “ROMÆ”, among other differences (see TIB 72 (Part 2 Supplement).411 S3). 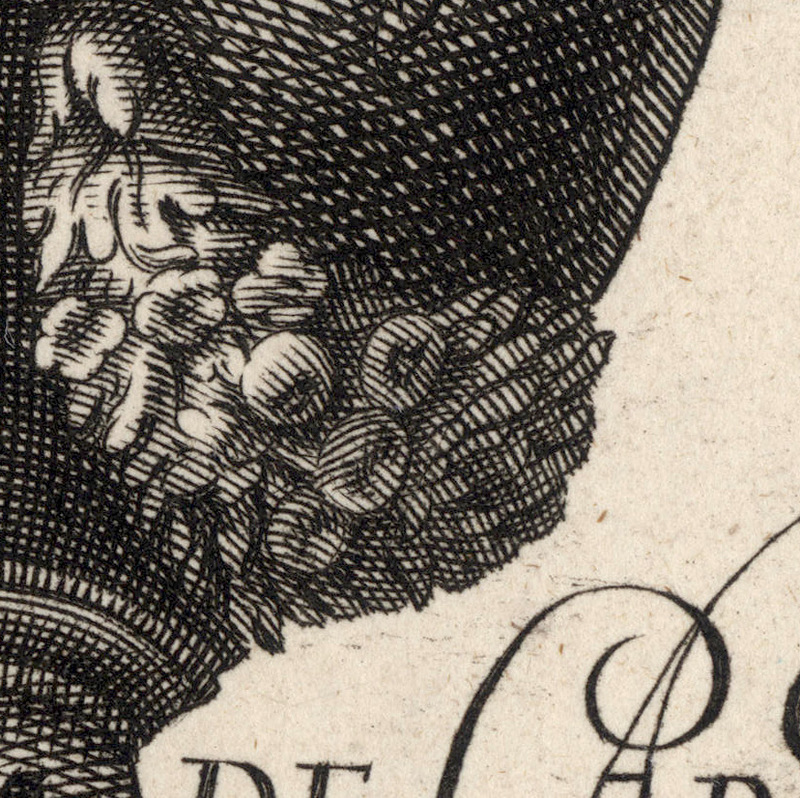 Condition: crisp and well-printed impression with printer’s creases (i.e. creases occurring during the printing process) and a tear at lower-left. This issue has been addressed by the backing of a support sheet of archival (millennium quality) washi paper. The sheet shows signs of handling (i.e. 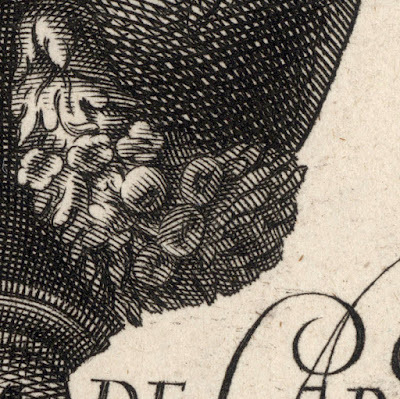 minor marks such as the angled mark in the margin at the lower-left edge). 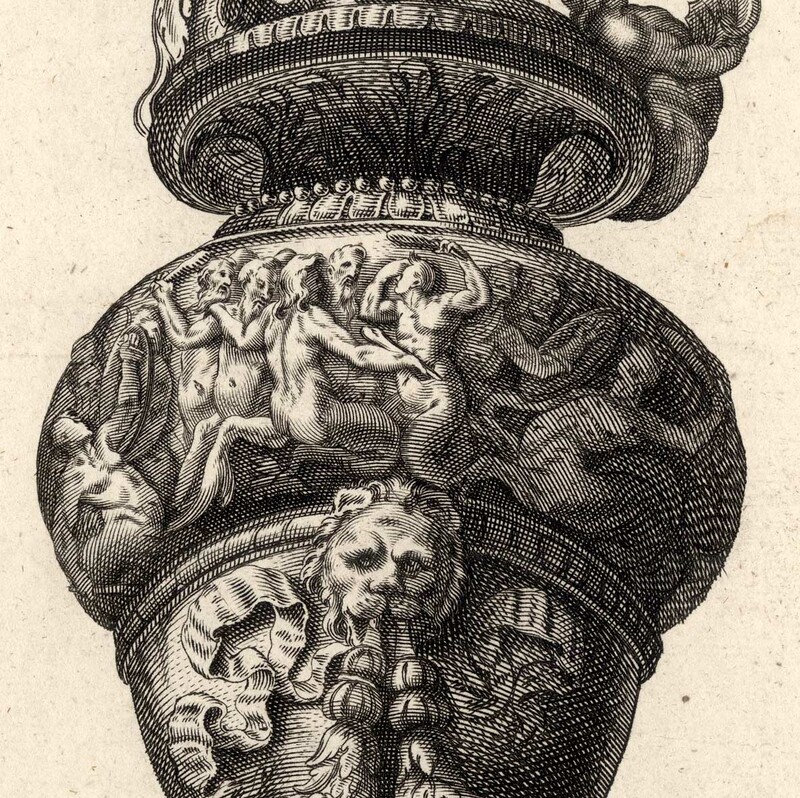 I am selling this early engraving in reverse of Cherubino Alberti’s print after Polidoro da Caravaggio’s fresco of the same subject for AU$168 in total (currently US$124.20/EUR107.32/GBP94.24 at the time of posting this listing) including postage and handling to anywhere in the world (but not, of course, any import duties/taxes imposed by some countries). If you are interested in purchasing this superb example of Baroque ornamental design, please contact me (oz_jim@printsandprinciples.com) and I will send you a PayPal invoice to make the payment easy. 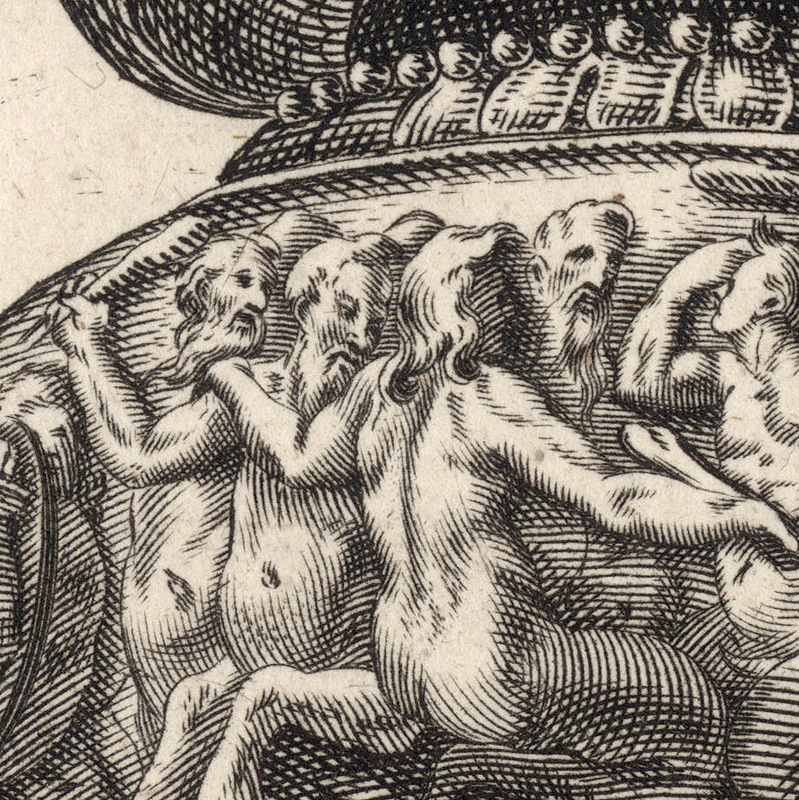 I was about to have a cup of coffee to set my mind to rest regarding whether or not I should be concerned about the formal title of this print given by Barsch— “Vase with Mermaids and Centaurs”—but I have decided not to think too much and just write what worries me. 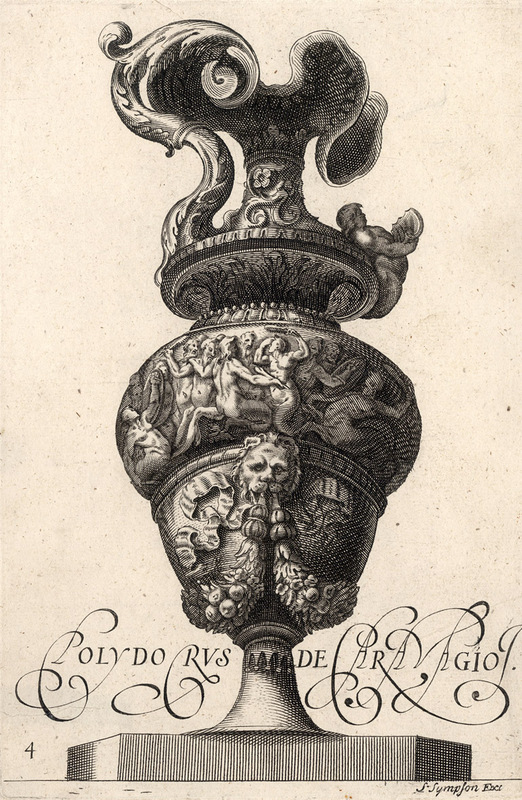 Worry number 1: this ornamental vessel is not a vase but rather a ewer. Worry number 2: the chaps portrayed battling in the decorative frieze around the middle of the ewer are not centaurs but rather ichthyocentaurs because they have fish tails rather than horse hooves. 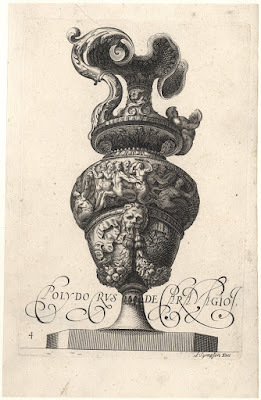 Although this print is a copy of Cherubino Alberti’s engraving executed in1582 (see http://collections.vam.ac.uk/item/O941154/engraving-alberti-cherubino/), Alberti’s engraving is not an original composition either. 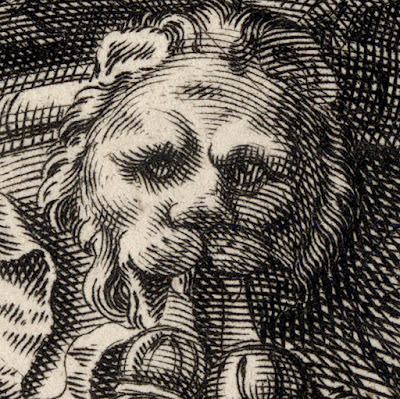 Instead, Alberti’s print is in turn a copy of a grisaille fresco (i.e. a grey painting) executed earlier in the 1500s by Polidoro da Caravaggio for a wall of the Palazzo Milesi in Rome. 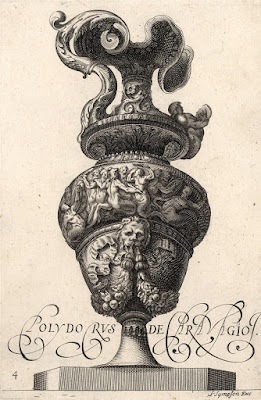 In fact, the copying of Caravaggio’s designs for ornamental vases and ewers features in at least two other artists’ oeuvres of which I am aware: the great Aegidius Sadeler II (see Sadeler’s copy at the V&A: http://collections.vam.ac.uk/item/O612188/engraving-sadeler-aegidius-ii/) and René Boyvin, whose series of ornamental vases and ewers show Caravaggio’s name inscribed as the designer on the first plate even if current research attributes the “real” designer as Léonard Thiry. 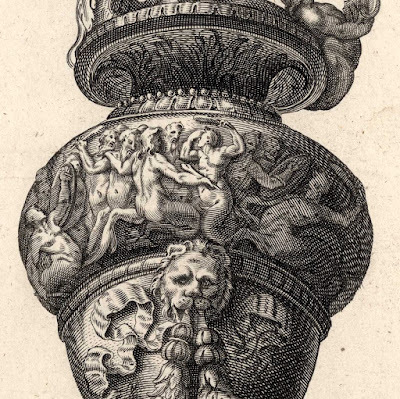 Indeed, I wonder if even Enea Vico may also have been influenced by Caravaggio’s frescoes and whether his engravings of very similar ornamental objects played a role in influencing Alberti and the later artists to copy Caravaggio’s designs; see for example, the awkwardly beautiful “Candlestick with a Faun and a Bacchante”, 1552, that I showcased in an earlier discussion: https://www.printsandprinciples.com/2017/11/enea-vicos-engraving-candlestick-with.html).